A few months ago in November, Open Voice Factory was featured on Disruptive Tech TV. This is the first UK 24/7 technology TV channel covering technology news and events worldwide. Open Voice Factory applied to be on their Disruptive Pitch TV show. Described as a sort of Dragon’s Den, it’s an online TV program for the UK’s most aspiring technology entrepreneurs, startups and emerging companies to pitch themselves to a panel of judges for the ultimate prize to a chance to keynote at the Cloud Expo Europe 2017 at ExCeL in London. The competition was fierce; Open Voice Factory was up against but thanks to Joe, the Open Voice Factory’s designer, presenting a fantastic pitch on the day, we actually won the round! Upon winning the round, Open Voice Factory was then invited to the Disruptive Pitch Final for a few months time. 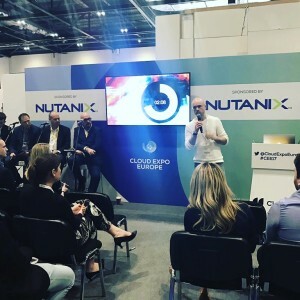 The final was actually held last week at Cloud Expo Europe 2017. The conference was incredible, hoards of people everywhere listening to keynote speakers from Google, Twitter and even the Ministry of Defense. There was a total of nine finalists all battling it out to be the overall winner of Disruptive Pitch. Once again, Joe gave it his all and he must have done something right because Open Voice Factory came third overall! Here’s what Joe said about the experience “I was pleased that we even won our round, so to come third feels like a great achievement and I’m confident that Open Voice Factory will continue to grow and help more and more people all over the world. We’ve all been really impressed here with Joe’s pitching skills, show your support and comment below!